The new android is out! 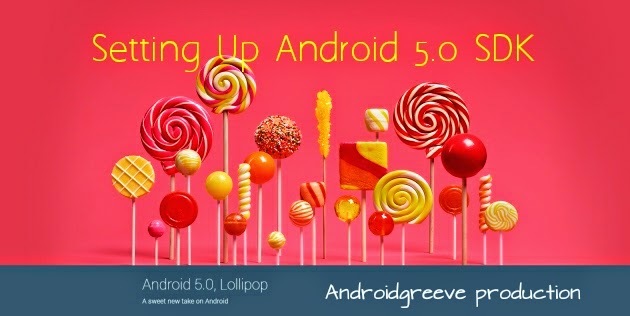 The new Android 5.0 has lots of things in box for developers. For development to start we need to set up the environment with the latest SDK from Android. 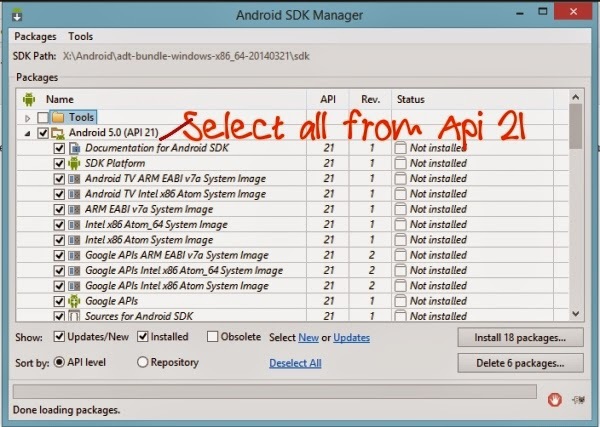 In this tutorial we are going to set up android SDK for Api 21 that is the Android 5.0.So we will follow step by step guide to set up the SDK. 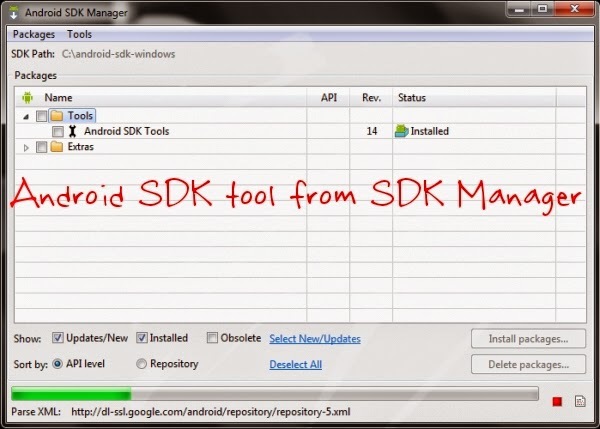 Step 1 -Download the Android SDK installer from: Android SDK Download. We’re going to use the Windows version here. 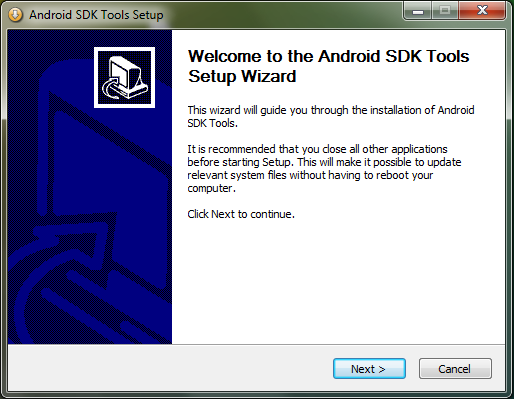 Step 2 -Install the Android SDK files you just downloaded to any location. Step 3 -Now, go the installed location and run the “SDK Manager” application. NOTE: If you have downloaded the zipped version of SDK, go to the location where you extracted the zip archive. Step 4 -Wait for the application to load and fetch all the Android SDK packages. Step 5 -Once completed, now select the packages you want to install. Here, we willbe only selecting the “Android 5.0 (API 21)” and “Android SDK Platform-tools” (underTools). You can leave the “Extras“.This should be enough. Step 6 -Click on “Install packages…”. You will be prompted to confirm the packages you chose to install and you would have to agree to the License information to proceed. Step 7 -Click on the Install button and now wait for the all the packages to download and install. 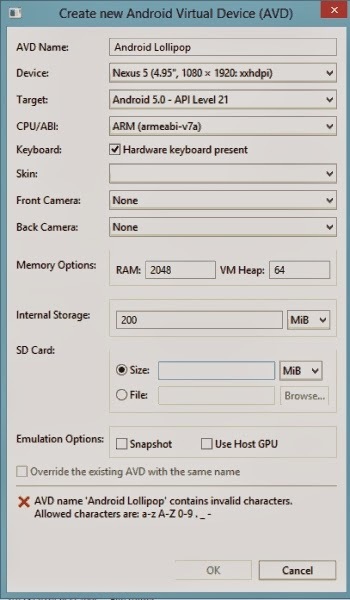 Step 8 - Go back to the SDK manager and run "AVD Manager" and set up as in the screenshot . Step 9 - Select the Device You created and run it. That it. You will find the virtual emulator running up! Step 10 - Most important step share this guide with Other developers so that they can also set up the SDk Hassle free. Thanks for posting this helpful guide. Hi there. Do you have the same problem such as when you create a new Android Application project it still show the text Compile with API 21: Android 4.x (Preview). It should show the API 21 Android 5. Do you know why?